A dialogue about all things HR relating to Christian Charities, led by Steven Plaum, Manager Human Resources, CCCC. January 1, 2017: Is your charity ready for Ontario’s next accessibility deadline? When Ontario’s next set of accessibility requirements come into effect on January 1, 2017 will your charity be ready? Are you compliant with the accessibility requirements that are already in effect? If not, now is the time to begin working towards compliance with Ontario’s accessibility laws. In keeping with the province’s commitment of becoming fully accessible by 2025, the deadline of January 1, 2017 will bring with it important requirements that every charity in Ontario needs to be aware of. For full details of what is required to comply with the legislation, charities should consult the Integrated Accessibility Standards (IASR). Charities that have at least one but fewer than 50 employees in Ontario (defined as “small organizations” in the IASR) will want to pay particular attention to the requirement of making their employment practices accessible. While meeting these requirements does not need to be difficult, most charities will need to update their employment practices to comply with the legislation. The employment standard module provided by AccessForward is an excellent resource (it’s also free!) that describes how organizations can make their employment practices accessible. The module is available in a variety of formats, and the video format only takes about twelve minutes to view. If you are responsible for creating policies and procedures in your organization, and haven’t already taken this module, it can also be used towards meeting the requirement of training your staff on Ontario’s accessibility laws, which is already in effect. For those of you on Twitter, I would also highly recommend following @ONAccessibility for timely news and information on accessibility from the Government of Ontario. I have found this to be a great way to keep up with some of the great work that is happening in the accessibility space, such as the Employer’s Toolkit: Making Ontario Workplaces Accessible to People With Disabilities, 2nd Edition developed by the Conference Board of Canada. This resource includes a number of free Word document templates that can be customized to meet the needs of businesses and non-profits. Thanks to mobile apps and websites such as Planat, it is becoming easier for the public to rate businesses and non-profits on how accessible they are in providing goods and services. With one in seven Ontarians having some kind of a disability[B] this development is not insignificant. When considering where to attend Church, or which Christian charities they want to work at or financially support, members of this growing demographic will naturally be drawn to the organizations that make accessibility a priority. 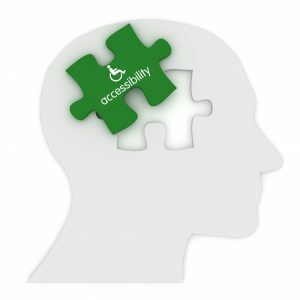 Achieving compliance with Ontario’s accessibility laws is not difficult, but it does require thoughtful consideration and a willingness to incorporate a mindset of accessibility into all that we do. While deadline of January 1, 2017 is quickly approaching, there is still time for charities to familiarize themselves with these requirements, and take the necessary steps to achieve compliance. With so many great free resources available to charities, there has never been an easier or better time to get started.